This estate’s intelligent design offers a breathtaking view of Bald Mountain, impressive vaulted ceilings and an abundance of luxury amenities suitable for the most discerning luxury travelers. With 13,800 square feet of living space, you will find an elegant great room with sophisticated furnishings, a large gourmet kitchen with beautiful finishes, multiple luxury bedroom suites with en suite baths, multiple wet bars throughout the home for entertaining, a gas lamp theater room for screenings, a library, gym, formal wellness space with steam room, sauna room, and room that can accommodate a massage table, a billiard room, custom bunk room and newly designed landscape finishes that include a pizza oven, Jacuzzi hot tub for 12, newly designed laundry room and so much more. 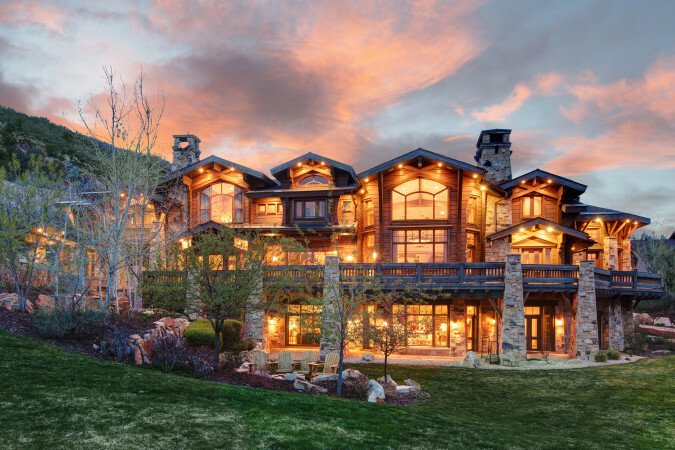 With two large family rooms this luxury estate is equipped to provide entertainment for large family groups, executives seeking a luxury corporate retreat and skiers looking for an astounding Park City lodging experience. This property’s abundance of size and privacy is insurmounted, coupled with just a 5 minute drive to the excitement and culture of historic main street and all three ski resorts alike. With two wings of bedroom offerings in the home, and all of the amenities in between, the estate’s floorplan can accommodate a diversity of groups looking to make memorable experiences in Park City.